On Saturday morning of our LA trip, Cindy and I started out the morning at Huckleberries in Santa Monica. I had read about this restuarant in an article and thought it would be a fun place to go have a nice breakfast. At first it didn't look like there was a line and I thought we had lucked out. But the line just went out the backdoor instead of the front. They had an interesting system. It was a small place, but you ordered at the counter and they gave you a number. You weren't allowed to snag a table until you had ordered and had a number. It somehow seemed to work and everyone ended up with a table. They had a really interesting menu. Not really your typical breakfast foods. This is a photo of my order, two poached eggs on oven roasted vegetables with pesto. 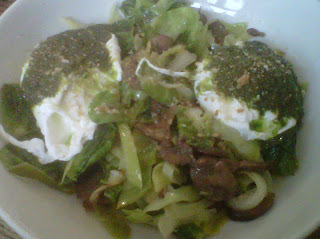 It was brussel sprout leaves, mushrooms, onions and garlic. It was really very tasty and pretty good for you. This was Cindy's. 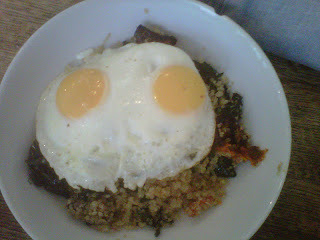 Two fried eggs on quinoa with kale and butternut squash. All superfoods! Of course they had an amazing bakery case too. We probably undid any good we did, by having some fabulous baked good too. We planned to then have a nice walk on the beach. We did make it to the beach, but the weather wasn't being very cooperative. It was windy and the surf was booming in, which was kind of fun. But then it started raining pretty good. We decided discretion was the better part of valor and gave up on the beach. We then went to our first time ever at the fabric district! LA has these amazing shopping districts in the downtown area. This was my first foray into them and definately not my last! It is mainly for wholesalers and manufacturers, but they sell retail too. It looks like a combination of an indoor mexican swap meet and the Mood fabric store in New York. There are bolts of fabric, trim, buttons, lace, beads, jewelry supply, notions, ribbons, craft supplies...you name it, everywhere. Some places are really clean and organized, others not so much. It was overwhelming to the senses. I didn't have any plan for anything I needed, but found a few things I decided I could use for different projects. Cindy got fabric to reupholster her patio furniture. And did I mention the prices? They are super loooow and in a lot of places you can bargain down even further. I did buy some really nice designer fabric in Michael Levine (the cadillac shop) that wasn't exactly cheap. I am assuming it was less than somewhere else, but I'm not enitrely sure. After a while it was hard to absorb it all. Some places only took cash. It is a busy, busy scene with all kinds of things happening up and down the street. The different districts spill into each other, fabric, garment, flower, toy, accessories, jewelry, etc. We went back on Monday morning and got some amazing deal on accessories (hairbands, watches, jewelry, ties, suspenders, purse). We went a little bit into the flower district and got some really beautiful flowers for our hotel room. We also got a few great houseplants. Very healthy and inexpensive. We are very excited to back another time. Especially with a plan of specific things we want to buy for! I have never seen anything quite like it. Go go go! I very much want to do a fabric trip with you the next time you decide to go. And I don't even know what I think I need the fabric for! But I just think it looks super fun.